Home Tag "rewards and recognition"
What has been the most enduring memory of a promotion in your career? Is it of a closed-room discussion on why you deserved the promotion? Is it of carrying a piece of paper that acknowledged your months of toil? Or did it last beyond that moment of glory and touch the lives of your loved ones? 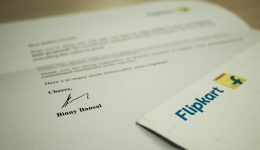 In September 2016, hundreds of Flipsters cherished their much-awaited moment of elation — a promotion that lasted beyond just them, and then. Read their story.